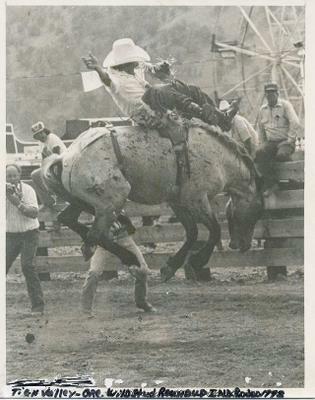 Charlie Wallace and Dale Small Rodeos "Hurricane"
I was 18 when I entered the Bulls and Bares at the Yellowstone Fair in Billings, MT about 1972. 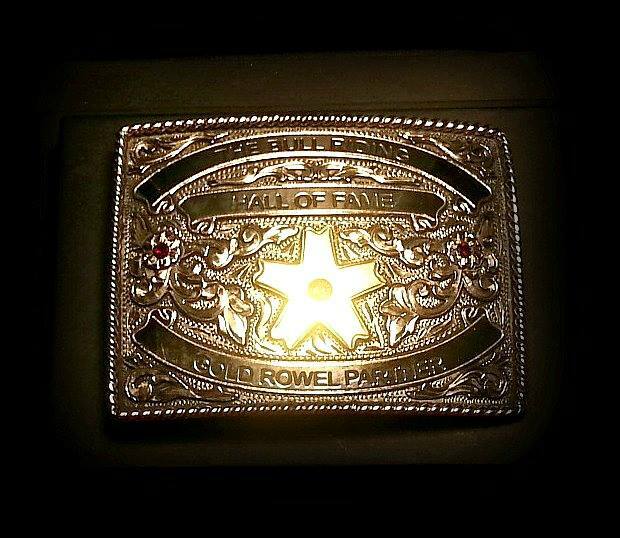 I didn't know much about it I was a kid just getting started in the rodeo business. I was also entered in the Crow Indian Fair and Rodeo at Crow Agency, MT 65 miles away the same week. 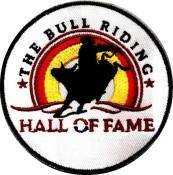 I attended the Billings rodeo one of the nights that week. Dale Small Rodeos had a bunch of spinning bulls he'd brought up from Oklahoma somewhere during those years and specifically a group of what Dale called his "weather bulls." Hurricane, Tornado, Typhoon, Knot Head and Double Purple. The night I was there Charlie Wallace who is now deceased got on Hurricane if my memory serves me correct. Charlie was a tough hand and built like a boxer at about 5'8". He wore these loud pink chaps with white fringe. Hurricane was a brown brindle bull about 1500 lbs with tipped horns and a feisty feller in the chute. One could hear him blowing his nose and bellering those low long bull bellers that means "get off my back." It was a night show on the old horse race track and in the stadium lights you could make out the forms of flies and moths flying around the big outdoor grandstand as vehicles drove by on the interstate. The weather was nice for once and about 75 degrees taking into consideration in MT it can pour a rain storm anytime at that time of year. The announcer probably Stan Rasmussen who is the current PBR funny man Flint Rasmussens father built the challenge up the way announcers do. Charlie got Hurricane to stand as best he could and nodded his head. The big green Powder River chute gate swung open and slammed against the chute it was connected to helped by Hurricanes powerful head and neck as he butted the gate open. The rodeo announcers voice got louder and louder. Gate help grabbed the gate to hold it back from rebounding back to an open position. It had to because Hurricane blew out of the chute and turned back right in the gate. It was a beautiful ride from beginning to end. The bull was spinning to the left, in the gate so fast he looked like a blur of dust, brindle, white and pink. Charlie's hat was about all you could make out as a rider on his back. The ride started with cowboys and a crowd rather silent. The bull had never been ridden up to this point. The crowd and cowboys started yelling and got louder and louder so much that you could barely hear the buzzer when it went off at 8 seconds. By then the entire stadium was screaming and yelling. That bull never hardly moved from the spot he turned back in. I'm not sure how many rounds he made but there were many. Finally the buzzer blew and Charlie checked out. It was absolutely amazing to see a ride like that as a 18 yr old kid and one I will never forget, a great inspirational moment in time for bull riding. Charlie win the money and Bull Riding won my heart at the same time. 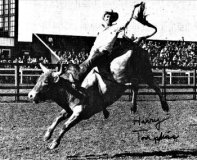 Dave Redboy Schildt - 1975 Great Plains Indian Rodeo Association Champion Bull Rider @ 21 yrs old.